to see over 135 nativity scenes from around the world! Previous years the Historical Society of Moreau at Parks-Bentley Place created an exhibit highlight Christmas around the world. Due to an anonymous donation and loan, the historical organization located in South Glens Falls, NY has close to 300 nativity scenes from around the world to display and alternate throughout the upcoming years. 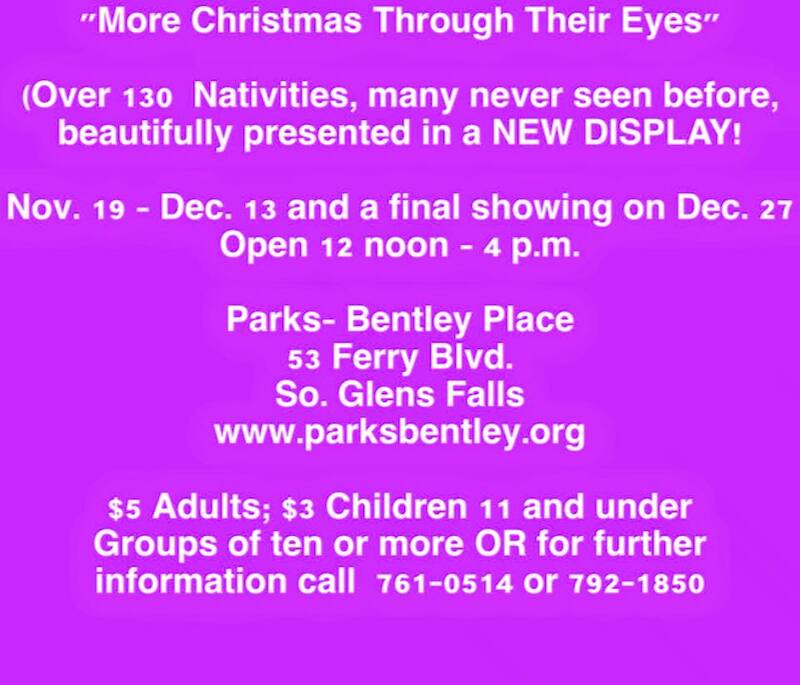 According to Parks-Bentley Chairman of the Board of Trustees Stan Maleok this is the second year for the nativity exhibit named "More Christmas Through Their Eyes." "We are a volunteer run organization so we are only open for a few weekends. We start tours the weekend before Thanksgiving and do to numerous requests we will be open for one special showing during the Christmas holiday," says Maleok. "So we will be open on December 27." 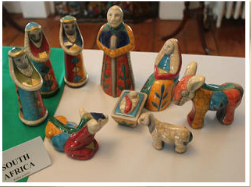 With almost 300 nativity scenes to choose from this year to Historical Society of Moreau has chosen to display each manger scene by the artist medium. There is a Nature room displaying crèches made out of corn husks, cloth, papier-mâché as well as other materials. Other rooms are sorts by Metal/Glass, Pottery/Porcelain and China and another just reserved for nativities made out of wood. 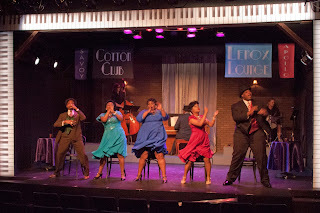 There are quite a few unusual pieces," says Maleok. " One set from Germany has a St. Bernard included in it since that dog is traditionally used for rescue and important to the culture. A Swiss piece has an owl with it while a set from Peru has a dolphin." Maleok mentions a few other pieces to look out for, "The nativity from Burkina Faso, which used to be called Upper Volta, is made out of recycled materials like nuts and bolts. There is even a set from Jordan that depicts one of the three magi as a queen." 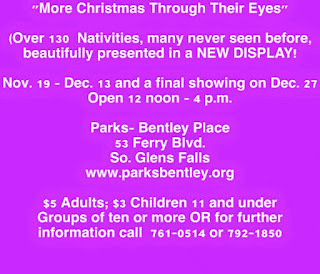 "More Christmas Through Their Eyes" will be on display at the Parks-Bentley Place, 53 Ferry Blvd. 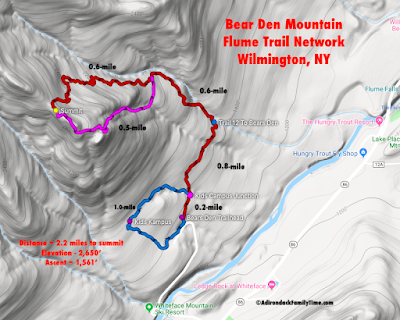 South Glens Falls in December 3,4,5,6,10,11,12,13, and 27 from noon - 4 pm . Price is $5/adults, $3/children (under 12). Please call 518-745-7741 for requests for special tours for the school groups.